Using e-cigarettes, referred to as vaping, works by heating a liquid to generate an aerosol that the user inhales. The liquid in the e-cigarette, called e-liquid, is usually made up of propylene glycol, glycerin, flavorings, water, and nicotine, although some users will substitute THC for nicotine. In practice, e-cigarette users tend to reach lower blood nicotine concentrations than tobacco smokers, although it is difficult to make a direct comparison because nicotine concentrations in e-cigarettes vary widely. Researchers and anti-tobacco advocates are especially concerned that irresponsible marketing has made e-cigarettes appeal to a younger population who does not have a history of tobacco usage. Tobacco use among middle and high school students has been steadily decreasing since 2014. However, since the introduction of the e-cigarette, that number is now increasing, and it is estimated that one in five high school students may now be using tobacco products. E-cigarette use from 2017 to 2018 increased 78% among high school students and 48% among middle school students. The first danger of e-cigarettes is associated with the carrier product known as propylene glycol (PG). PG is primarily used in the production of polymers and in food processing. It can be found in various edible items, such as liquid sweeteners, ice cream, and whipped dairy products. It can also act as a carrier for various inhalant pharmaceutical products, including nicotine. PG is a viscous, colorless liquid that possesses a faintly sweet taste and is one of the major ingredients of the e-liquid used in e-cigarettes. When used orally, the breakdown products of PG include acetic acid, lactic acid, and propionaldehyde, which are all toxic to enamel and soft tissue. In addition, PG is a hygroscopic product, which means water molecules in saliva and oral tissue will bond to the PG molecules, leading to tissue desiccation. The result of this is xerostomia, or "dry mouth," which has been shown to lead to an increase in cavities, gum disease, and other oral health issues. The second danger of e-cigarettes is due to other major component of e-liquid: glycerin and flavorings. Vegetable glycerin (VG) is a colorless, odorless, viscous, and sweet-tasting liquid. It has a myriad of applications, including medical, pharmaceutical, and personal care. In the food industry, it serves as a humectant, solvent, and sweetener. It is 60% as sweet as sucrose and is not metabolized by cariogenic bacteria, and is therefore thought not to cause cavities. However, studies have shown that the combination of VG with flavorings produces a fourfold increase in microbial adhesion to enamel and a twofold increase in biofilm formation. In addition, a 27% decrease in enamel hardness was demonstrated when flavorings were added to e-liquid as compared to unflavored controls. The viscosity of the e-liquid also allowed Streptococcus mutans to adhere to pits and fissures. In other words, e-liquid allows more cavity-causing bacteria to stick to a softer tooth and can lead to rampant decay. Another danger associated with e-cigarettes has to do with nicotine. Although the percentage of nicotine is much lower (0.3%–1.8%) than traditional tobacco products, one electronic cartridge (200–400 puffs) can equal the smoking of two to three packs of regular cigarettes. The dangerous effects of nicotine on gum tissue are well known. The literature suggests that nicotine affects gingival blood flow as it is a vasoconstrictor. It also affects cytokine production, neutrophil function, and other immune cell function. In addition, nicotine decreases connective tissue turnover. All of this results a much higher chance of developing gum disease and tooth loss. Recently, a 24-year-old man from Texas was killed when his vape pen exploded, and part of the device wound up severing his jugular vein. Although these types of sensationalized deaths are rare with e-cigarettes and vaping pens (only three reported to date), the explosions of these pens are not. The problem lies within the vape pen and the lithium batteries overheating and exploding. These explosions are usually attributed to improper charging of the device or have been linked to a type of device called a mechanical mod that has no internal safety and can overheat and explode. One report found that 195 of these adverse events occurred between the years of 2009 and 2016. However, Dennis Thombs, dean of the School of Public Health at UNT Health Science Center, published a study that concluded the number of vape explosions in the US were most likely underestimated. Thombs estimated that there were 2,035 e-cigarette explosions and burn injuries in the US between 2015 and 2017—more than 40 times the initial estimate by the US government. These injuries are serious and often lead to disfigurement of oral soft tissue. The bottom line is vaping can be just as dangerous, if not more dangerous, when compared with smoking. The problem is that vaping is thought to be a safer alternative to traditional tobacco products, and companies are adding flavoring products to attract younger generations. According to a 2013–2014 survey, 81% of current youth e-cigarette users cited the availability of appealing flavors as the primary reason for use. 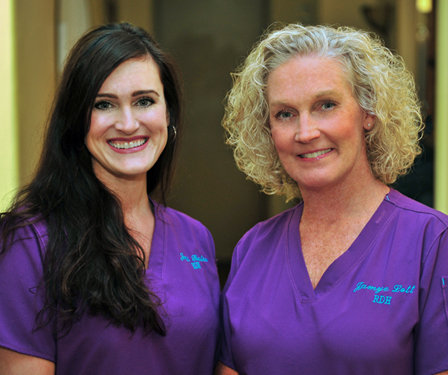 For example, one patient of a general dental practice had a caries-free history for 35 years. He ceased smoking traditional cigarettes and decided to vape as he thought this was a healthier alternative. Within a year, cervical enamel demineralization and interproximal lesions were present on the mandibular anterior sextant, consistent with the primary point of contact of the e-liquid aerosol. In another example, a young patient had been using e-cigarettes for five years. He started vaping as a method to quit smoking traditional tobacco products thinking vaping was a healthy alternative. Because of its ease of use, he smoked a cartridge of one of the more popular vaping products a day. Admittedly, he also drank energy drinks (high sugar content), stating that his mouth was often dry after vaping. This combination led to rampant decay with smooth-surface lesions and future tooth loss. Many advocates of vaping claim that e-cigarette use and vaping poses 5% the health risks of traditional tobacco smoking and claim its use to be helpful in getting people to quit. This particular use does have merit and has helped many individuals quit smoking. Unfortunately, these studies have only analyzed e-cigarette use in former smokers using vaping as a way to stop smoking. The studies have not looked at the health effects of nonsmokers who start vaping because of the perceived innocuous health effects and because it "tastes yummy." In addition, these studies have not looked at vaping in middle school and high school individuals, the group where e-cigarette use is increasing the most in percentage of use. Because of this, a tidal wave of oral health problems is heading our way. 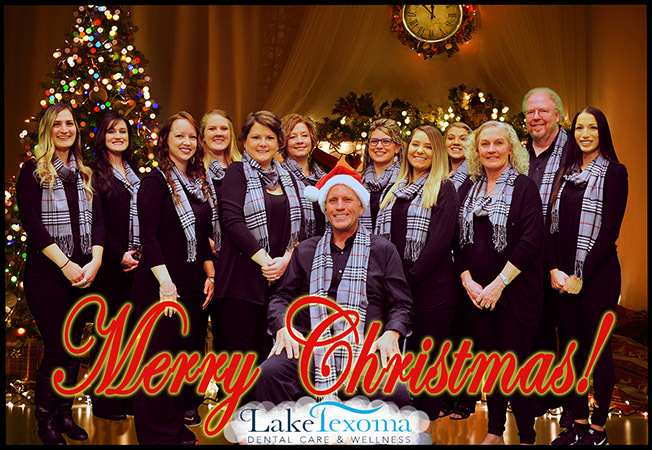 Lake Texoma Dental Care & Wellness would like to wish each and everyone of you a very Merry, and Blessed Christmas.